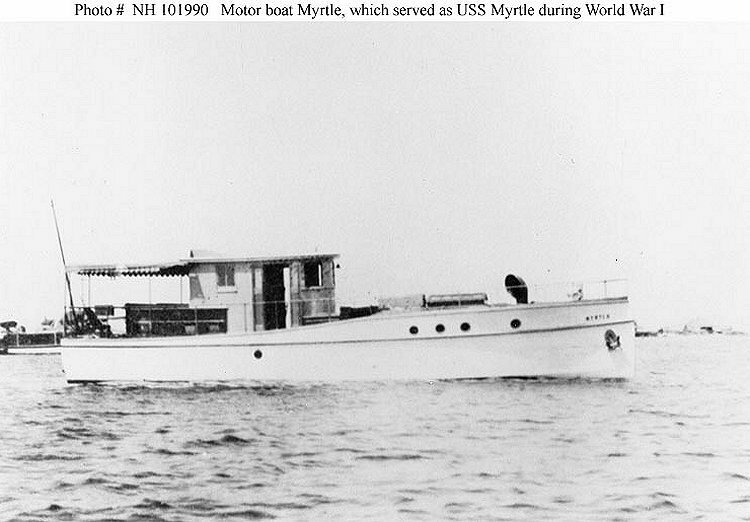 Motorboat: Built in 1915 by T. B. Hayman, Elizabeth City, NC; Acquired by the Navy, 16 October 1918; Returned to her owner, 27 January 1919. Fate unknown. Specifications: Displacement 21 t.; Length 40' 9"; Beam 11' 8"; Draft 3' 9"; Speed 9 kts. ; Complement six; Armament none. 65k Photographed prior to her World War I U.S. Navy service. 116k In port, probably at Norfolk, Virginia, when she was inspected by the Fifth Naval District on 26 August 1918. 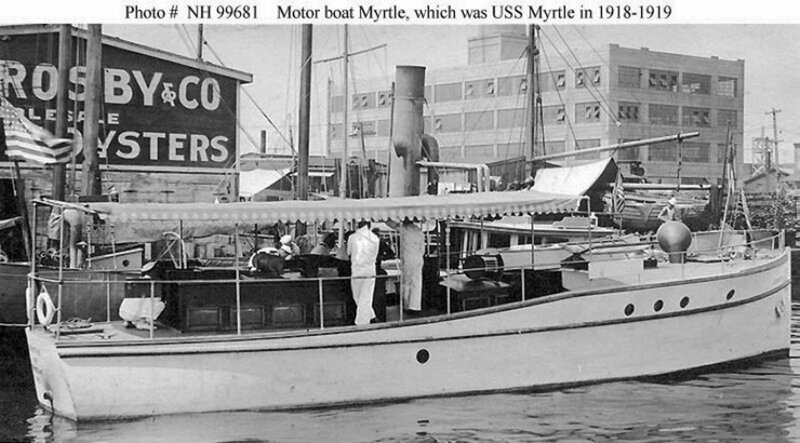 Dictionary of American Naval Fighting Ships: The third Myrtle (SP-3289), a wooden motorboat, was built by T. B. Hayman, Elizabeth City, N.C., in 1915; leased by the Navy from her owner, A. B. Rascol of Windsor, N.C., 16 October 1918: and assigned to the 5th Naval District. During the remainder of the year Myrtle carried out patrol and dispatch duties in the Norfolk area. She was returned to her owner 27 January 1919.